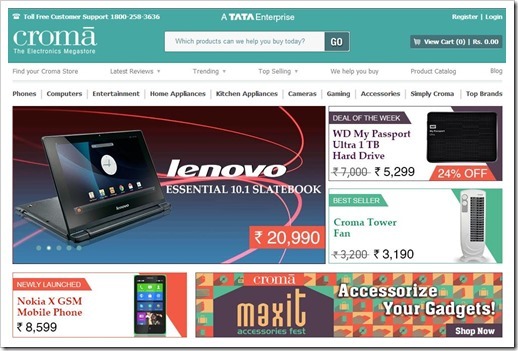 Croma Retail has introduced a very interesting new feature: Store Pickup. Using this, consumers can now order online via Chroma website and pick up their product from the store on the same day itself. This new service was inaugurated by Ajit Joshi, who is the CEO and MD of Infiniti Retail Ltd, the company which runs Croma stores. This announcement was made at the opening ceremony of 101st Croma Store in Mumbai recently. There have been some serious discussions going on between online vs offline retailers lately. Offline retailers of electronics goods are feeling threatened by the onslaught of ecommerce portals which are offering products at a steep discount, having low margins on profit. Offline retailers are alleging that the biggies of Indian eCommerce space are backed by huge venture capital, which is prompting them to offer such low ridiculous prices. Some offline retailers have even launched a comprehensive campaign “We Will Act” to create awareness about this ‘conspiracy’ led by venture capitalists. In one instance, offline retailers are even asking the government to impose an “Entry Tax” on the goods purchased online! Some brands such as Nikon, Netgear, Lenovo and Toshiba have stopped providing warranty for the products purchased online, which is again a very immature and anti-consumer action. But then, technology is something which you cannot stop from spreading; in fact, in the new age of connected economy, technology is the factor which is fueling growth and progress. Offline retailers will have to adapt themselves or they will perish. Croma have done exactly the same this time: they have adapted themselves to be in tune with the technology and the convenience which online shopping provides, and integrated with their own brick-and-mortar stores to provide maximum value addition to the end user. Besides this new feature, Croma is also pushing itself to include more services and options for the end user, so that they can compete with the online portals. When price can’t be fought with even lower prices, then services and value-additions come into the picture and this is what Croma is doing right now. For example, in the new PrabhaDevi Store of Croma, they have placed toys right in the middle of the store. These are not placed for children to play with but for camera enthusiasts to check the clarity and focus on their new cameras! Croma is also planning to place small portable kiosks at railways stations and bus stands to help educate the consumer about various products and order them online. In one another experiment, they are placing self-checkout card swapping machines at the stores so that customers can beat the queue at the bill counter. Will this new store pickup facility by Croma lure customers away from ecommerce portals? Do share your views by commenting right here!